A gymnast who dislocated both knees and tore multiple ligaments in a horror fall on Friday (April 5) looked in good spirits just hours before she underwent surgery. Samantha Cerio was competing in an NCAA gymnastics regional event and had just started her routine when she landed hard, resulting in both legs buckling beneath her and causing the life-changing injuries. Initial reports suggested that Cerio, 22, had broken both of her legs and dislocated both knees, but the possibility of broken legs was ruled out after initial testing at the hospital. The gymnast was making her first pass and was attempting a handspring double front with a blind landing when she landed badly and fell to the mat, reports Nola.com. Cerio could be seen screaming in agony after the fall, clutching both her legs on the floor before medical staff rushed to her aid. Her coach Jeff Graba, who said he had never seen an injury like Cerio’s before in his 30+ years of coaching, confirmed the gymnast was having surgery yesterday (April 8) in a statement posted to Twitter. Emphasising that Cerio was ‘in great spirits,’ her coach also thanked Auburn and Louisiana State University (LSU) medical staff for the ‘outstanding care’ they have provided to the 22-year-old. Sam is a fighter and is in great spirits. We couldn’t have a better leader for this team. 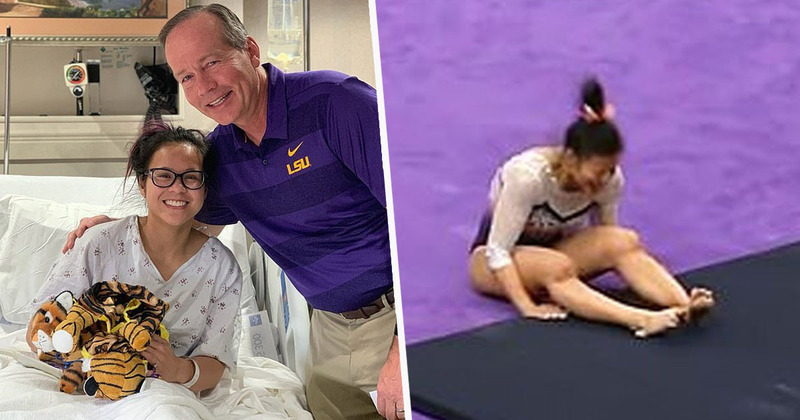 Also visiting the gymnast’s bedside was LSU President F. King Alexander, who tweeted a picture with Cerio as she sat up smiling from her hospital bed. The 22-year-old later thanked Alexander for his support, adding that LSU have been ‘so kind and supportive’ throughout the incident. I had the opportunity to visit @AuburnGym’s @sam_cerio this weekend. What a wonderful, inspiring young lady. I have no doubt she will overcome this injury and go on to do amazing things. Cerio has since revealed Friday was her final night as a gymnast, taking to social media to announce her retirement. Telling fans she ‘couldn’t be prouder of the person that gymnastics has made me become,’ the gymnast said although her career may not have ended as she planned, ‘nothing ever goes as planned’. Cerio is due to get married to long term partner Trey Wood in June, with the couple announcing their engagement in November last year. We hope Samantha has a full recovery.